I am pleased to announce that Inquisitor 2.0, an instant search extension for Safari, is now available. Much like the web-based Inquisitor Instant Search, Inquisitor 2.0 combines as-you-type instant search, search term prediction, and multiple-engine searching in a refined interface. Inquisitor 2.0 transcends its sibling by offering elegant integration with Safari, faster speed, higher quality results, and a customizable interface. As previously discussed, Inquisitor 2.0 is being experimentally under a donation-ware license where users are asked to donate something prior to downloading. My hope is that the project can be made sustainable in fair way by allowing users to contribute based on their own judgment of the project’s value. Inquisitor 2.0 for Safari is on track and looking great. While the AJAX-powered web version is great for reaching a new audience, I still believe that a toolbar-based instant search delivers a superior user experience, and I would very much like to deliver this enhanced user experience to Safari users. That said, not everything is rosy. The entirely free, no-strings-attached release of Inquisitor 1.0 was an experiment. I wanted to see if donation-ware could work in the Mac world. The unforunate conclusion has been that it does not. I do not want to make the same mistake with Inquisitor 2.0. Absent any other alternatives, I have decided that Inquisitor 2.0 will experimentally released under a pay-per-download model. That is, users will have to pay a trivial $1 or $2 levy to download the software, in an attempt to recover the development expenses and time that have gone into this. Why am I considering pay-per-download? Well, one advantage is that it’s far easier to do than a full-blown registration system. While the levy is very small, if everyone gives a little then everyone benefits. It seems more equitable that way. Alas, it is true that there’s no solid way to enforce the levy. The software could be traded easily between friends or posted on an unauthorized website. The former I view as a form of viral marketing and the latter is traceable and can be dealt with as a clear-cut breach of license. Ultimately, this will be as much an experiment as anything, and that’s why I’m talking about this before the software’s release. If it succeeds, more projects of mine may move to this model. If it fails, then there won’t be an Inquisitor 3.0 (for the Mac, anyways). UPDATE: I am rethinking the fixed $1 or $2 download levy and considering an open-value ‘mandatory’ donation. Users would be free to donate as little or as much as they desire, but they would be required to make some donation to download. Inquisitor Instant Search has been updated to support keyboard navigation of results. The controls are pretty simple: up and down arrows move the selection; return/enter and right arrow keys activate the selection. One of the first questions that came up when I showed off the Inquisitor 2.0 teaser shot was ‘can you do this for another browser?’. I must admit, targetting Safari alone didn’t make much sense, so I decided to code up something that works for any browser, Mac or Windows. Inquisitor Instant Search is the result of this effort. 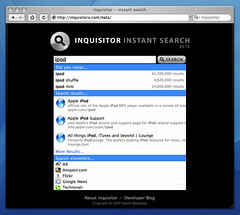 Inquisitor Instant Search combines as-you-type instant search, search term suggestion, and multiple-engine searching in a single elegant and original user interface that can be used in any (modern) browser like Firefox, Internet Explorer, or Safari.